The E-flite® Inverza™ 280 BNF Basic is a collaborative original design by RC aerobatic world champion Quique Somenzini, full-scale aerobatic aircraft craftsman Kevin Kimball and aviation artist Mirco Pecorari. Never before has an aerobatic aircraft been developed with a more dynamic team effort. 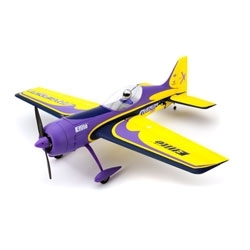 Its unique blend of performance, grace and potency offers exceptional aerobatic performance for 3D, precision or scale flight, sized for you to enjoy at a convenient park or small field. Everything about its design, from its fit and finish to its original outline, reflects exceptional attention to the needs of performance minded pilots. As soon as you open the box, its design clearly reflects what experience has been missing from the world of aerobatics. Read more on the collaborative creation history of the Inverza in the Hotrods of the Sky Gazette featured on the Jim Kimball Enterprises INC. website by Clicking Here.